Hi all Autohotkey Forum member. And restart my explorer.exe but nothing happen, seem only place my shortcut inside this folder cannot create pin item on taskbar. I also found this post, but it was wrote in AutoIt, I cannot convert it to Autohotkey because it is out of my knowledge. Hope someone will help me. For Autohotkey I found InvokeVerb, but I don't know how to use. Is there a way to add a toolbar to the taskbar? 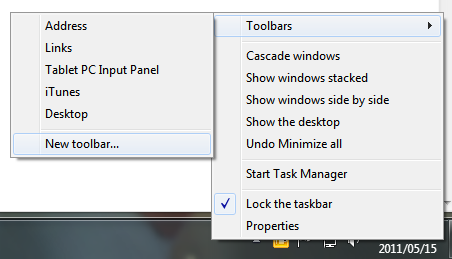 A specific folder like "D:\toolbar\"
Sorry for bumping my topic, But can I ask you a question about "Pin to Tas&kbar", is this menu work on Windows XP or only Windows 7 ?